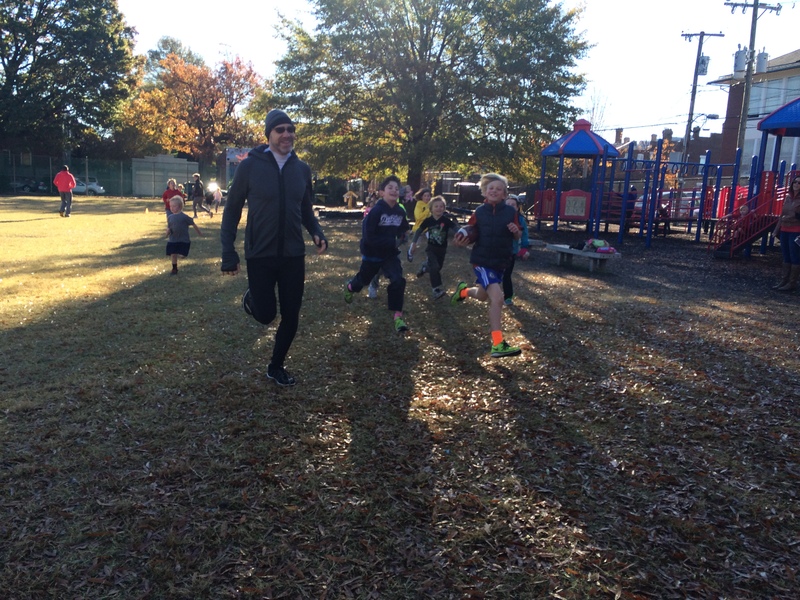 On a chilly fall morning, Friday November 7th to be exact, I got the opportunity to visit one of our local run clubs at William Fox Elementary School. When I arrived, I noticed that there were cones set up around the perimeter of the field. Jonathan Kuhn, the Fox Run Club Coordinator, explained that 6 laps around the field equaled one mile. As the kids started to arrive, many of them joined by their parents, they all started running around the field at their own pace. Each time they got back to the designated starting point they excitedly grabbed a craft stick from one of the parent volunteers. Although there were at least a dozen parents running – these sticks were for the kids only. 1000 Mile Challenge . . . .
Jonathan explained that the sticks were used to track how many miles each child was completing, as well as total the club’s mileage throughout the season. The day I visited was their 13th session of the current fall season and it was also the day that the kids were hoping to reach their goal of running 1,000 miles. I jogged away thinking about the significance of that. 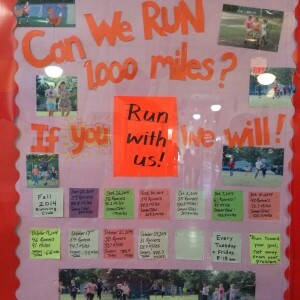 1,000 miles logged by a group of kids that run for 30 minutes before school twice a week. Elementary school kids – some as young as 5 years old. Pretty incredible right? So I decided to join in for a few laps and meet some of these awesome little Fox runners. Their legs may be little by their miles are long! I first met Tony Caramucci – I just had to meet the 5th grader that reportedly ran the Ukrop’s Monument Avenue 10k in the spring. So as I ran with Tony (and let me tell you – it was quite a nice pace he had me running!) I asked him about his experience running in the 10k. He proudly reported that he ran it in 57 minutes. For those of you who may not know, 57 minutes is quite an impressive time – especially for a child who was only in the 4th grade at the time! Tony then told me that he had plans to run even longer distances. Specifically he stated that his goal is to “run a half marathon before I turn 20 and run a full marathon before I turn 30!” Clearly this Fox runner is ambitious. I assured him he could reach those goals and would likely meet them even earlier than he anticipated, according to his progress thus far! I also had the chance to catch up with one of the club’s younger runners, Kyra Evans, who is 6 years old and was running with her mother. I couldn’t help but notice that she had acquired quite a few craft sticks. At the end when she went to turn in her sticks I found out that she had completed 2.5 miles that morning. Another notable Fox runner, Efrain Rojas, has logged 42 miles this season. When you do the math, Efrain is averaging over 3 miles at every run club session. Jonathan’s own two kids, Zachary and Madeline, were also out there participating in the run club that their father coordinates. Cow bells and more running! Who is in this village? Jonathan Kuhn, the volunteer run club coordinator, does not pull off this feat by himself. He is the first to tell you that! His wife Jodi is responsible for the data entry and also creates the end of the season certificates. There is an assistant coordinator, Bronwen Warner, who will actually be taking over the coordinator responsibilities in the spring. 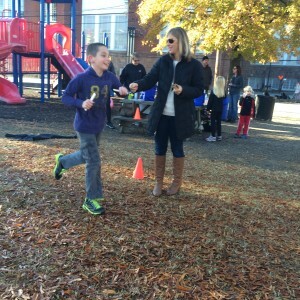 Jen Smith-Slabaugh, a former Fox PTA president, actively advocates for the run club with the PTA and school administration. 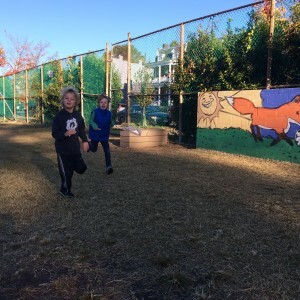 Daniela Jacobs, the principal at Fox, is a staunch supporter of the run club and makes frequent announcements over the PA to encourage kids to come run. 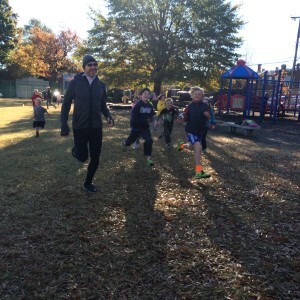 Fox’s PE teacher, Marques Baytop, is also actively involved in the run club and applied for a grant through Sports Backers’ Kids Run RVA program. 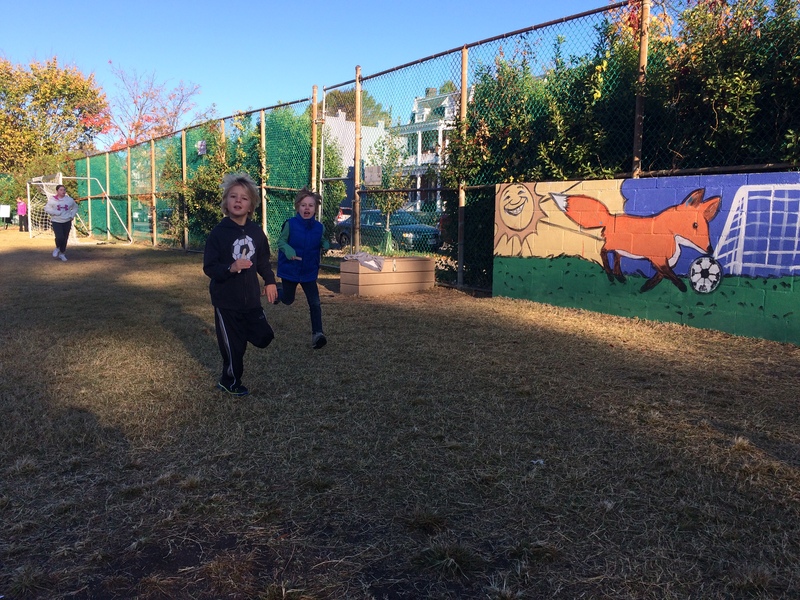 As a result of his efforts, the Richmond Road Runners and Sports Backers provided grant funding to support the run club at Fox. 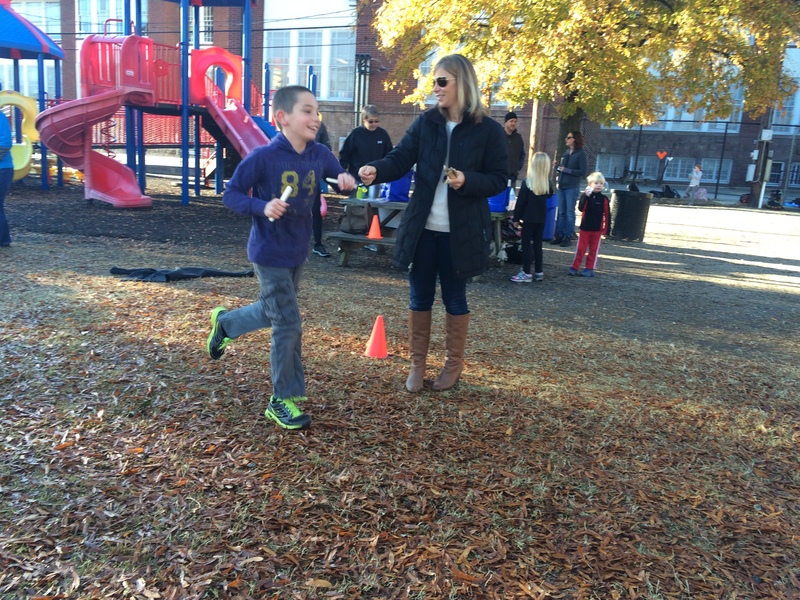 But it doesn’t stop there – there are a plethora of parent volunteers that each play an important role in making the run club at Fox a continuing success. 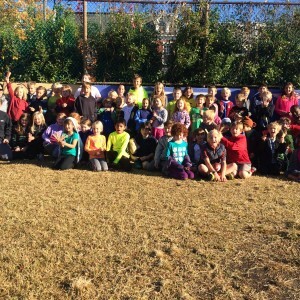 So it truly takes many members of this village – parents, teachers, administrators, Sports Backers, PTA representatives, and of course the kids themselves – to make this run club a success. And it doesn’t hurt that the coordinator of it all, Jonathan Kuhn, happens to be an expert in analytics and therefore has helped create this awesome mileage tracking. 1,000 miles is awesome but there’s more to this thing . . . 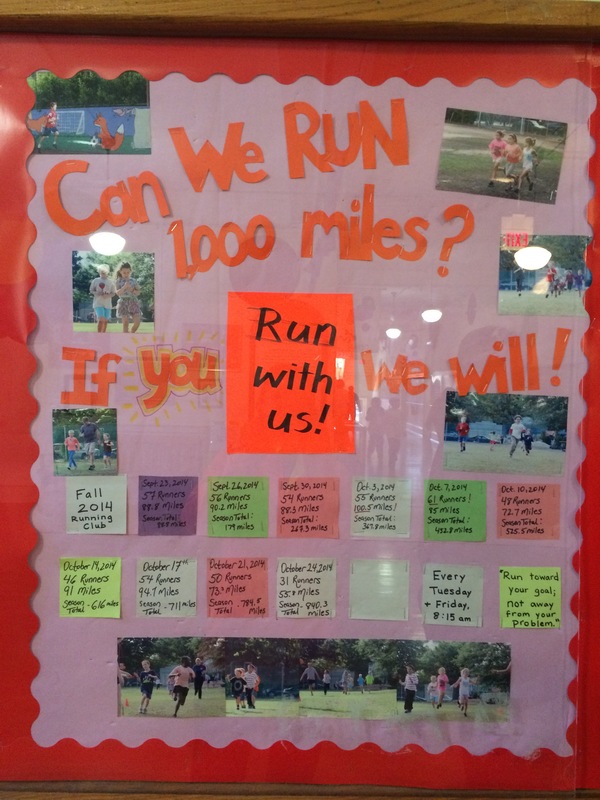 Kids all over Richmond are logging their own miles! Walking away from Fox that day I got really excited thinking about how there are run clubs happening in schools and neighborhoods all over the Richmond region. 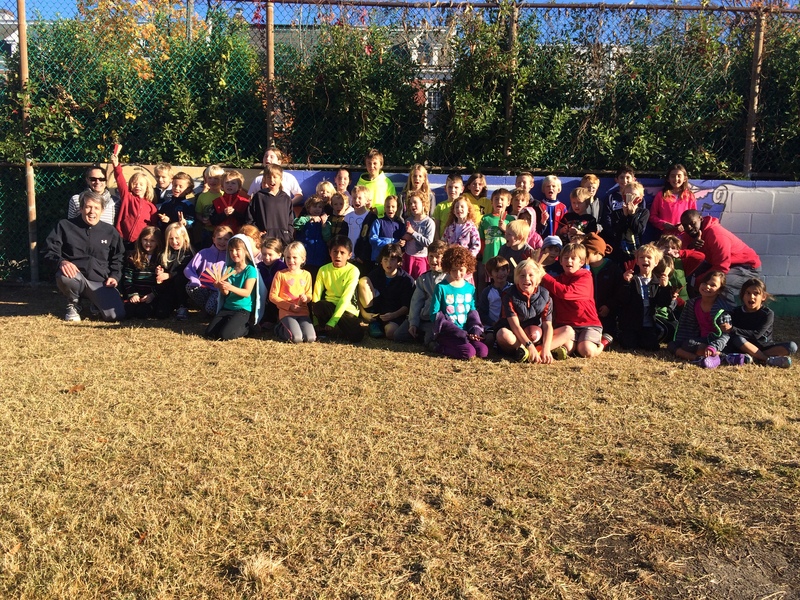 During this fall alone there were 32 run clubs throughout the Richmond region that were supported through the Kids Run RVA program. Check out the list of run clubs to see if there is one in your community. If you can find a way to play a role in your local run club I encourage you to do so. Remember – it takes a village to raise a child but when the village comes together there’s just no stopping our Richmond youth!